The long and storied history of the Southern All Star Series came to a shinning end on Saturday night at Birmingham International Raceway with the running of the World Classic. It might not have been the two best races in SAS history, nor was it two sleeper races either. Instead, the Southern All Star Series (and some also say the legendary Birmingham International Raceway) came to a final close with two worthy winners in Victory Lane. The race was more of a battle to see if Helton could catch and pass the youngster Hamner. It was a battle of veteran verses young gun. But on this night, the young gun came out on top. 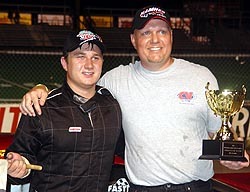 Last year, Josh Hamner won the Pro Late Model portion of the World Classic and loved every minute of Victory Lane. In fact, he loved it so much, he’d been dying to get back there this year. He had said, several times, that he was tired of the big “goose egg” that showed up on his website under the win column for 2005. Well, that “goose egg” is no longer after Saturday night. 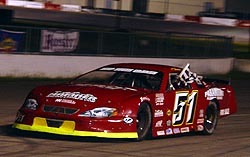 Hamner dominated the 100-lap Pro Late Model (two-barrel) portion of the World Classic on Saturday night. Hamner, who had set fast time the night before, lined up third, worked his way past Gary Helton for second, then set his eyes on leader Chris Whorton and took the lead on lap 12. From there, he cruised to the finish, fending off the charges of Helton and Whorton during a couple of mid-race restarts before a clean and green race for the final 40 laps. It was Hamner’s night. And it was a special one. “The World Classic means a lot to people in this area of the country,” said Hamner, “so this is a great win. It is really nice to back up winning the race last year too. I know the first year it just wasn’t a fluke. Whorton was able to hold on to third place, which earned him his second-straight Southern All Star Series Pro Late Model Championship. 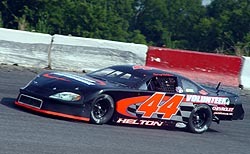 Gary Helton never led in the Pro race, despite starting from the pole. On lap 85, he found himself battling for the lead with Augie Grill. On lap 87, he was in the lead. On lap 100, he was sitting in Victory Lane with the final Southern All Star Series Super Late Model trophy and an extra $2,000 for winning from the back of the pack for the second straight-year. Bradberry started at the tail of the 18-car field and worked his way up to 13th in the early stages of the event. But for many laps, his #78 just stalled outside the top-10. He wouldn’t loose spots, but he wasn’t gaining them either. Up front, Shane Sieg was putting a hurting on the rest of the field. He grabbed the lead from Josh Hamner on lap seven and pulled out to a near full-straightaway lead on the rest of the field. In the back, Bradberry was struggling. He came in to pit a couple of times during cautions to try and figure out the problem. The team worked and worked and worked, and Bradberry never seemed to go too far into the top-10 after working on the car. Then, however, came the last 30 laps. Bradberry’s #78 pitted with the rest of the front leaders with 40 to go and came back out as a new car. Bradberry charged into the top-10. Then, after a few cautions, he found himself in the top-five. Charlie Bradberry gave the crowd a well-deserved bow after the race. On Saturday night, Charlie Bradberry had a choice to make right before the start of the SAS Super Late Model Series event. Bradberry could elect to start from his scheduled sixth-place starting spot after setting fast time and pulling a six pill for the invert, or he could elect to go to the back of the pack and try to win the race and earn an extra $2,000 for doing so. With 17 other cars in the field, it was an easy choice for Bradberry, but for 70 laps, it looked like it might have been the wrong choice. “I think we had a stagger problem there early,” said Bradberry. “The rear stagger was messed up and I could feel it. Something happened with the first set of tires. The right rear grew. It was so loose, I was just holding on. So was Bradberry ever worried that his call to start from the back was the wrong one? “Nope. I knew the car had been great here all week. This car is really touchy on stagger. I knew if we got it back to normal, things would be fine and they were. This is the first time I’ve run this car here and it is a brand new Port City South car. It has taken us a little time to get the bugs worked out on it. Bradberry got a $7,000 payday. 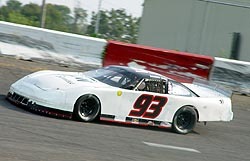 Sieg impressed many with his second-place finish at BIR in his first ever visit to the track in a Super Late Model. Ken McFarland, who looked to have a car that might contend for the win before a late cut tire put him behind, finished fourth, with Hamner coming home fifth. For Charlie, the win was a special one. Grill had a shot for Bradberry after a late-caution flag bunched the field up with just five to go. 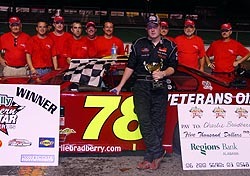 He didn’t get the jump on Bradberry and eventually even lost second-place to Sieg at the stripe. Shane Sieg's impressive run surprised many.. except maybe himself.